Another old fashioned garden plant, Heliotrope is widely used both in mass plantings as well as a clumping feature in the garden border. Good foliage, masses of attractive flowers, easy care and attracting bees and butterflies to the garden, this is a landscapers delight. It is the species Heliotrope arborescens that is widely grown, it provides us with many cultivars and is a wonderful low growing ground cover plant often called simply, ‘Cherry Pie’. An evergreen perennial plant originally from South America it grows in many areas of Australia however is best in areas of low humidity. Evergreen with deep green to purple heavily textured foliage and brilliant purple flowers from spring though to summer wholesalers offer a number of cultivars worthy of consideration. 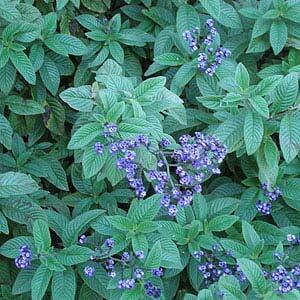 Heliotrope is very attractive to butterflies and bees, grows well in full sun to light afternoon shade. Landscapers are turning more to these versatile flowering plants, great foliage, and great ground cover plants. Heliotrope ‘Cherry Pie’ spreads to around 1m with deep purple flowers that have a vanilla fragrance. Heliotrope ‘alba’ – A variety with white flowers. Heliotrope ‘aurea’ – Golden to buttery yellow foliage with pale mauve flowers. Heliotrope plants are available for sale from the following wholesale growers.